6th January – Vigil Mass on Friday evening 5th January at 7.30pm in Knockraha (to coincide with First Friday Mass). On Saturday 6th January, Mass in Little Island at 10am. 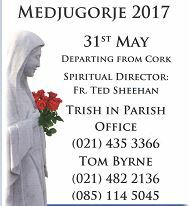 Mass at 8.30am in St Mary’s Church, Knockraha and Mass at 10am in Glounthaune followed by Exposition of the Blessed Sacrament until 3pm. Caherlag after 12 noon Mass. St Joseph’s after 11am Mass. Deacon Jaimie Twohig, a native son of Little Island, is to be ordained a Priest for the Pallottine Order on the 16th July at 12 noon. St Vincent Pallotti was inspired on January 9th 1835 to found the Union of Catholic Apostolate to promote the involvement and collaboration of all the baptised in the Mission of Christ. The Society has 2300 members, who live in more than 300 local communities in all continents and in more than 40 countries. The members, priests and brothers, bind themselves to the Society by the promises of chastity, poverty, obedience, perseverance, the sharing of resources and the spirit of service. The basic motto of the Society is the words of St. Paul “the love of Christ urges us” (2 Cor 5,14). Mary, Queen of Apostles, is the Patroness of the Society.The Ordination will be celebrated by Bishop Buckley in St Joseph’s Church, Little Island. Jaimie will be the first young man to be ordained in this church and it is an occasion of great joy for all the people of, not only Little Island, but also those within our parish in Glounthaune, Knockraha & Brooklodge. On Sunday 17th Jaimie will celebrate his first Mass in St Joseph’s at 4.30pm and great preparations have been undertaken by volunteers within the parish. We are truly grateful to Pauline and her hardworking team for their help. There is an open invitation to all parishioners to Jaimie’s First Mass and refreshments afterwards in Little Island Sports Complex. Please join us for this blessed occasion.As part of our preparations there will be overnight Eucharistic Adoration from 9pm Thursday 14th July until 6am on Friday 15th July. The Adoration will begin and end with the celebration of Holy Mass. Every hour of the adoration will have community prayer and a time for quiet prayer. Please join us for part or all of the Adoration as we pray for Vocations to the Priesthood (thanking God for Jaimie’s vocation) and religious life. It is an occasion in which we pray for young men and women who may be contemplating a life of service to the Gospel, to Jesus and His church.